If holographic displays were to become a reality, they would instantly overload the internet due to their bandwidth requirement. At 5E16 bits per second for a single display (50 peta bps), their information stream is larger than the total international internet traffic (estimated at 100 tera bps, 100E12). So, the brute force approach leading to such a massive number should be circumvented. In this talk, I will investigate various solutions for making a 3D display, and discuss the limitations of the different technologies. I will show why holography is the ultimate display but at a massive data expense. Eventually a solution that reproduces all the visual cues at a lesser bandwidth will be exposed. Finally, we will see how the same principle of holography can be applied to increase the internet capacity by making better, faster telecommunication switches. From display to ROADM, holography is a tool that can be exploited to save the Internet from drowning under data overload. Prof. Blanche initially graduated with a degree in nuclear physics. However, being passionate about holography, he also received a Ph.D. in this field from the University of Liege (Belgium). He then held a post-doctoral position at the University of Arizona where he developed new refreshable holographic recording materials called photorefractive polymers. Back in Belgium, he co-founded a company manufacturing large size holographic gratings for the optics industry, astronomers, and space applications. Prof. Blanche returned to the University of Arizona in 2005 where he is currently an Assistant Research Professor. 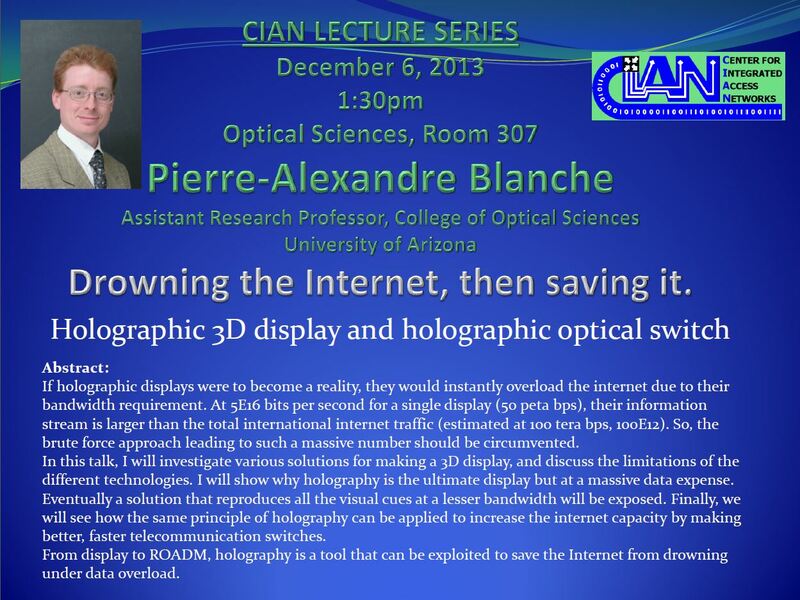 Prof. Blanche is an author of several book chapters and more than 30 publications in international peer reviewed journals; he has presented at numerous conferences, and holds several patents covering holographic display and telecommunication switches. Professor Blanche is author of the SPIE Field Guide to Holography due to come out next February. His fields of interest are diffraction optics, 3D display, non-linear and photonic materials, and he never lost his passion for holography. This entry was posted in Research, Videos and tagged 3D, nanophotonics, optical communications, Optical Sciences, photonics, research, video. Bookmark the permalink.